Will Allen Robinson Ruin Your Fantasy Season Again? 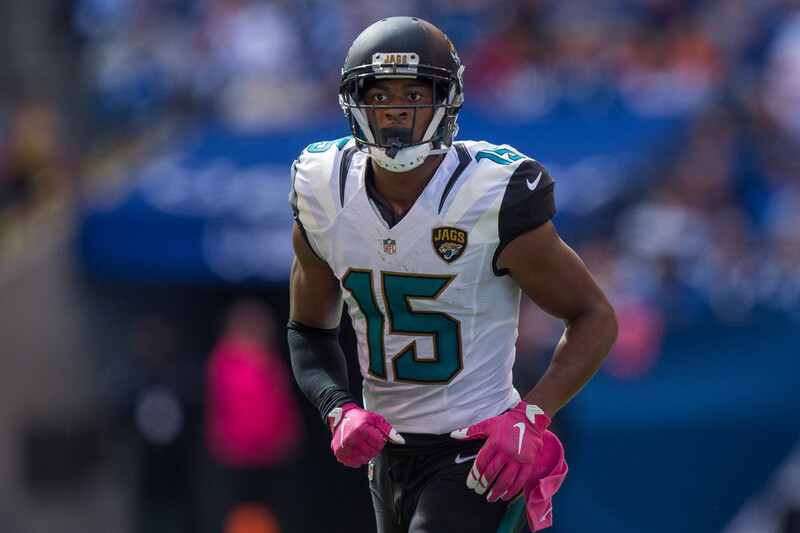 Was there any bigger bust in fantasy football last season than Allen Robinson? He didn’t get hurt. He didn’t stop getting targets. He didn’t suddenly have an awful schedule. He just sucked. You drafted him in the first round and rolled him out all year long and he was nothing but disappointing. And you sure as heck aren’t going to make that mistake again. At least that’s the story Robinson’s average draft position is telling. ARob started February drafted late in the 4th round fresh off his disappointing season, then rising as high as 3.04 in April before a steady decline to 4.08 today, and falling. 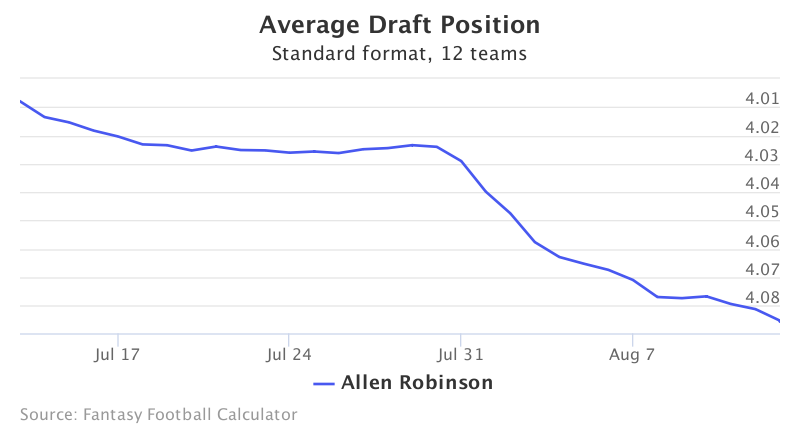 Here’s a graph showing Robinson’s ADP over the past month using data from 12-team standard mock drafts. At 4.08, Robinson is being drafted as WR18 behind the oft-injured Sammy Watkins and the newly-signed Terrelle Pryor and Alshon Jeffery. So should you take a gamble on ARob in 2017 or avoid him at all costs? At first glance, you’ll see a massive difference between Robinson’s 2015 and 2016 seasons. First came 1400 yards and 14 touchdowns in a breakout campaign, then a disappointing season that saw Robinson fail to reach 900 yards or half that TD total. The results seem as different as day and night. But dig a little deeper and Robinson’s 2015 and 2016 seasons are more similar than you might think. During that top-five breakout, Robinson had 151 targets, almost ten per game. Last year? Exactly 151 again. Robinson had 21 redzone targets in 2015. Last season he had 22. He finished top-12 in overall and redzone targets both years. A receiver can only catch a ball near him, and Blake Bortles was awful last year. Robinson caught 14 of his 21 redzone targets in 2015 but just 8 of his 22 last year. He had the lowest catch rate (48%) of any receiver in the NFL among the top-50 in targets. Robinson led the team in targets 11 times. He still got every look but wasn’t getting catchable balls. Robinson also wasn’t getting quite the same sort of looks. Jacksonville had a miserable offensive line and a pitiful run game in 2016, so Bortles was repeatedly under pressure and Robinson didn’t run as many long routes. In 2015, ARob had 11 catches of 35+ yards and 31 receptions of 20+ yards. Last year he had only 11 catches of 20+ yards and just three over 35. Those long catches accounted for 985 yards one year, 293 the next. That’s certainly a big part of the precipitous yards per catch drop from 17.5 to 12.1. Heck, just taking away Robinson’s 90-yard touchdown from 2015 drops that YPC almost a full yard from one play. What’s left is a supremely talented receiver getting WR1 targets on the field and WR1 targets in the redzone. Fantasy football is about opportunity, and Robinson is still getting a huge amount of it. He’ll benefit from the Jaguars adding offensive tackles Branden Albert and Cam Robinson and drafting stud running back Leonard Fournette. With more honest defenses and less pass rush, those Bortles passes should be on target and Robinson has a great chance to bounce back. Even a simple regression to the mean should send Robinson toward 80 catches, 1000 yards, and 10 TDs, more than justifying his WR18 ADP. Even his worst case scenario from last year still left him a top-30 receiver, not a terrible outcome at WR18. And the upside is a WR with 1st-round potential in the 4th round. Your leaguemates might be afraid to let Allen Robinson ruin another season. Maybe you’ll have to do it for them.